Secretary of the Kyiv Council Oles Dovgyi celebrates his birthday today. The young official made his confession in the morning. He said this to a correspondent of Vip-ua.com. According to his words, he makes confession before Easter usually, but this year he had a desire to make his confession on his birthday. 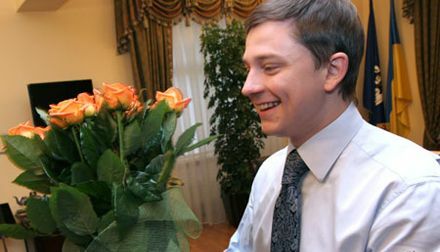 Journalists presented to Dovgyi iris flower during the news conference, which was before the session of the Kyiv Council. Guards presented to “dear body” the parrot and taught him to say “Dear deputy!”.